The GoPro Karma, from the action-camera specialists has finally hooted in our ears as it has been highly anticipated. 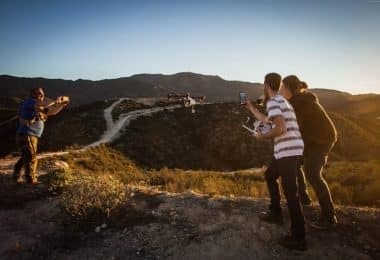 The logic is simple here; GoPro produces highly sought-after action cameras like the HERO 5 and HERO 4, so having the Karma will be an added advantage for professional aerial photographers and videographers due to a top notch quality. That being said, pilots can use this quadcopter for fun or professional aerial views to take high quality and stabilized aerial footage made possible by the motorized 3-axis gimbal and/or the handle grip. 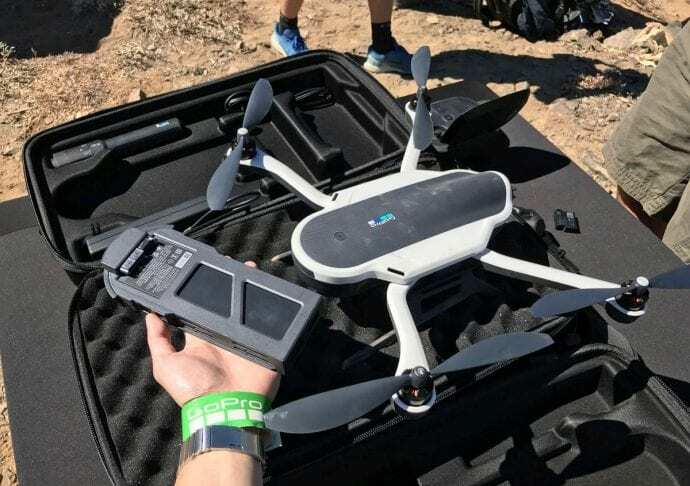 GoPro has entered the competitive multirotor industry with a unique and compact drone design as seen in its placement of the gimbal stabilizer, and the optional camera mount, Karma Grip. Be aware: Although this Karma multirotor is an RTF (Ready to Fly) model, which is expected to have all components in place, it still requires the purchase of the camera to take footages. It comes standard with the harness for HERO5 Black, but other optional cameras that are compatible with it include the HERO 5 session, HERO4 black/silver. Apart from that, other components such as the battery and the Karma Grip are included in the package. Then you will be set to take a flight once all is set up. 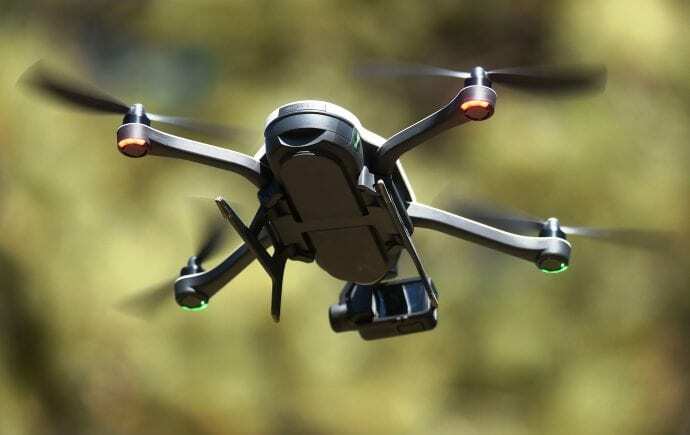 The UAV gurus may find this drone elementary as it comes pre-configured in order to accommodate everyone, including those who have never flown the drone before. The manufacturer has not mentioned anything about the availability of the ARF or BNF models. We will have to wait until the drone has been re-launched presumably in the spring of 2018. Perhaps such models could be available for the excitement of experienced and hands-on pilots. For detailed review watch this video. It’s actually fun and cost-saving to own this drone. Firstly, it’s easy to procure its replacement parts such as the propellers and the arms should it get damaged from inevitable crashes. These parts are sold separately from the manufacturer. So this option saves you money from having to buy the new drone simply because some parts have broken out. 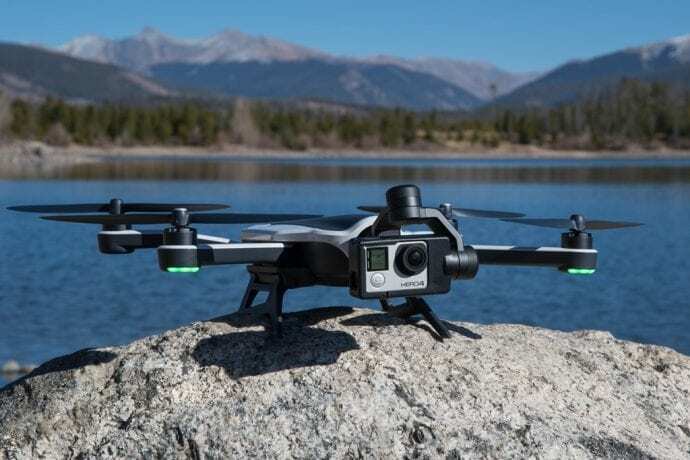 Well, the manufacturer also brings good news with the GoPro Care to be launched soon as well, wherein users can get their drones replaced in case they get broken. Furthermore, this quadcopter can perform incredible acrobatics in the air with its 4 flight modes. 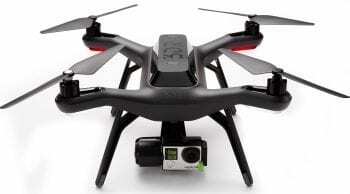 You can maneuver its paths to take the desired aerial footage. All these are made possible by the intelligent video-game-simulated remote controller that make use of 2 joysticks, a flip-up LCD touch screen, and a land/take-off press button. And in order to add more fun in the aerial footages, you can make use of the downloadable passenger app. With this app, your friend can manage the camera settings on a compatible device and also view the live feed. That’s fun enough because you will be focusing on controlling the drone and achieving a range of modes in the air. Another piece of advice: When purchasing this drone, keep in mind that it costs about $800 excluding the camera. Additional costs could be the purchase of the mandatory GoPro HERO models. So we reckon that you get an optional harness for, for example, GoPro session as the overall price could cost $1000 compared to the overall price of $1100 when the HERO5 Black is bought. Remember that it comes with the integrated harness for HERO5 Black. Again, please be cautioned about the possibility of counterfeit products on the market. We recommend that you buy from the manufacturer or credible online stores. Excluded from this packaging is the HERO5 Black camera that has to be bought separately. But other GoPro HERO models can also be bought together with their harnesses. The gimbal is compatible with any of those camera models. The first notable unique design is the compact and portable body where the propellers and the landing gears can be folded so that the drone can fit in your backpack. The propellers fold inward, while the landing gear folds upward against the drone. Otherwise, you can just detach the propellers if the extra space is needed. The drone’s dimensions are 12 X 16.2 X 4.6 inches if unfolded, and 14.4 X 8.8 X 3.5 inches when folded. The overall weight is 35.5 oz. Consider the camera weight as well. Furthermore, the gimbal and the harness for HERO5 Black are mounted in the front of the drone. One of the reasons is to eliminate the view of the propellers when taking aerial footage. The landing gear and the impact resistant arms will protect the drone in case of any damage. But, if the damage is tremendous, the replacement parts are available. This Karma copter is furthermore characterized by the black & white colors, wherein the landing gear is color-coated black. There are also lights underneath the propellers with two red lights on the rear side and the other two green lights on the front. Karma doesn’t come with a built-in camera but a harness for HERO5 Black and a camera stabilizer, gimbal. That said, you have to purchase the HERO5 Black separately to start using it for fun or for professional images. Other models of GoPro camera can be used too. The camera will be front-mounted to take clear aerial images without obstruction of the landing gear. It is capable of recording 4K videos and capturing 12 megapixels images. There’s plenty of camera controls to be manipulated on the flip-up 5-inch LCD touch screen display found on the controller. 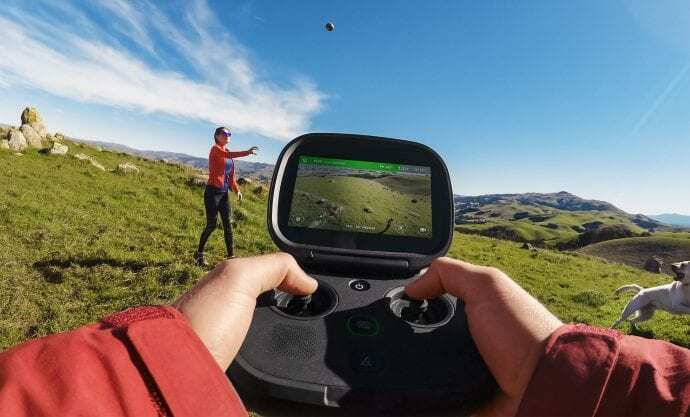 These controls can be accomplished mid-flight, thus eliminating the need to land the drone. Furthermore, you can detach the camera and mount it on the Karma Handle Grip for handheld or mounted stabilized images. This means, you will be capturing images on the ground while the drone flies. The second person can be able to view live feed or control the camera settings on the Passenger App that can be downloaded to any compatible device. This gives you the freedom to fly the drone without multitasking with the camera controls. Karma comes with the included battery that is said to last for 20 minutes in the sky before landing. And it takes an hour to fully charge the battery if it has run out. It is therefore advisable to have additional batteries for quick exchange to avoid having to wait for an hour while the battery is charging. The flight time relies solely on the battery. Other than that it can be affected by strong winds. In addition, the Karma Handle Grip and the camera come with their batteries. The grip has a long battery life of approximately 1 hour and 45 minutes. 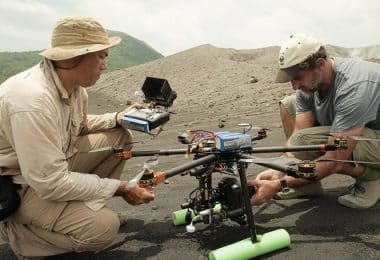 The logic shows us that the drone’s battery will run out while the grip is still functioning to continue taking footage. This is good in the event of changing batteries for the drone. The grip powers the gimbal, and they can charge simultaneously. The package comes with the Karma remote controller that has a 1km control range. It features a video-game-like pad with 2 joysticks, a take-off/land button, and a 5-inch bright LCD display. From the controller, you can have a full control of this drone and maneuver its incredible acrobatics. You’re assured quality and incredible footage with these modes. All made possible by its intelligent controller. Furthermore, the drone can return to home should it lose signal or run out of power. Check this video to witness the sterling performance of Karma controller. All pilots, amateurs and the experienced, will find this flight easy to control and to optimize. It has a flight simulator where amateurs can be orientated until they excel at controlling the drone from elementary to advanced flight modes. The drone can be flown at the speed of 56km/h. You can also indulge in racing with this kind of speed. Furthermore, to avoid legal battles, you can preset the drone not to fly in restricted zones. That’s the best way to avoid the wrath of the FAA for flying in forbidden paths with possible radio interference or obstructions. The incredible performance of this drone is also seen in its auto-landing and auto-take-off using the push button on the controller. There’s also an auto-return home when it loses signal or its battery gets depleted. These controls are all managed on the large 5-inch touch display. You can also set the drone to fly in your desired mode, which could be the Dronies, Reveal, Orbit or Cable Cam. With a whopping price estimation of $800, you can get the package that includes almost all the needed components with the exception of the camera. It’s in fact a good value for money when taking into account the fact that some of the ARF models are expensive, whereas you still have to buy additional accessories at high costs. The additional price to the Karma could be the addition of the HERO5 Black, and the overall price could be $1100. But, if you opt for the HERO5 session, it could be $1000. Add to the full price the replacement parts such as the propellers, the harness, the core or the landing gear. These are likely to get damaged during inevitable crashes. You may spend about $199 for these replacement parts. What’s new from the manufacturer is the GoPro Care available from $149 for a two year warranty. If the drone gets broken, it can be replaced. This means that you will have to replace the damaged parts after the two year warranty period has elapsed. To start with, the placement of the gimbal and the HERO5 harness on the front is unique because most drones put them underneath. The underneath position fails to keep the propellers and the landing gear out of view when shooting, notwithstanding the main reason behind that. 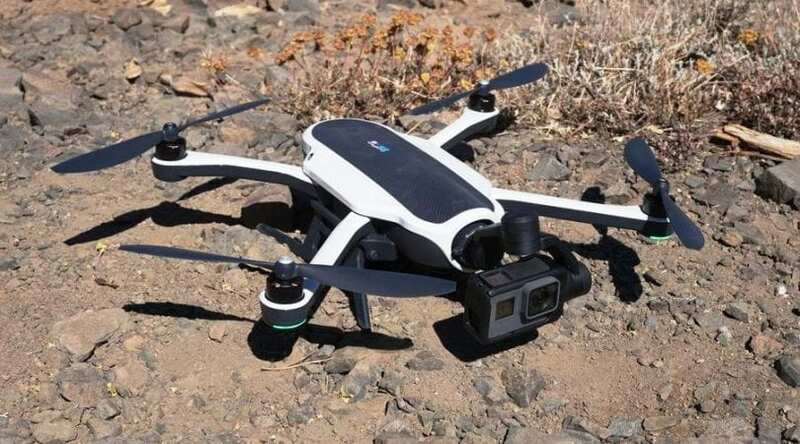 GoPro decided to bring its own feature, different from other popular drones on the market. Moreover, the detachable 3-axis gimbal is a unique feature. You can simply attach it to the included Handle Grip for ground-based aerial image shooting. The grip is also capable of controlling the camera settings. It stabilizes the camera for silky smooth footages. Furthermore, the grip can power the camera, thus negating the need to detach it for charging purposes. The other unique feature is the availability of the replacement parts for this RTF model. 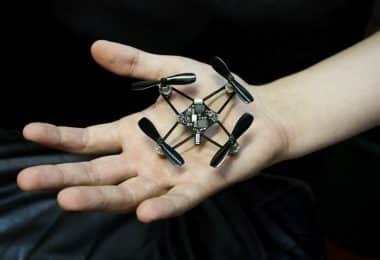 It’s uncommon to find an RTF model with replacement parts, which then means that you have to replace the whole drone or take it to the specialists. So with karma you can replace the parts on your own, and you can find them at an affordable price, approximately at $199. Check this video for a glimpse on the replacement parts. The passenger app is also a unique feature that is lacking in most premium drones of this caliber. Your mate can pair with you in controlling the drone. 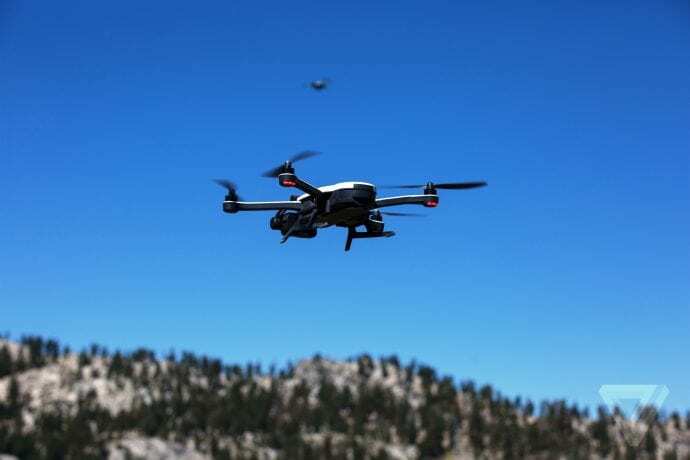 For instance, when one controls the drone using the remote controller, the other may use the app on a compatible device to control the camera settings while at the same time viewing video live feed. With DJI Phantom 3 you can take 2.7K HD videos and 12 MP photos compared to the 4K videos and 12 MP of the Karma. It is unsurprising because GoPro cameras have predominantly taken the forefront of camera quality in the industry. So if you want high quality videos, Karma over-powers the DJI Phantom 3. However, performance wise, we have to play our cards right as the DJI provides a fierce competition. To start with, it comes with a longer flight time of 25 minutes over the 20 minutes of Karma. There’s also an SD card, something that we haven’t heard of in the Karma brand. Moreover, the GPS assisted flight features are a plus to the DJI as you they allow to have a full control of flying the drone safely and also taking incredible aerial images. These drones almost had similarities with regard to the mobile apps. With the DJI, you can view the live feed on the DJI GO app, whereas with Karma that live feed can be viewed on the mobile app by someones else while you view it on the 5-inch LCD touch display. It is also easy to understand and to fly the DJI Phantom 3 by focusing on the manual and the videos for troubleshooting as in the Karma where the flight simulator feature is integrated. Price wise, the DJI is relatively inexpensive at $500 compared to $800 of Karma. Moreover, the camera is included in the price of the DJI. Check this video for a comparison between these quadcopters. 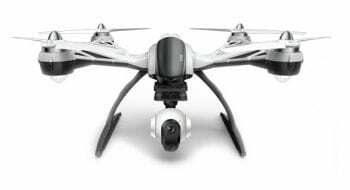 This is also a quadcopter manufactured by the drone giant, Yuneec. It comes with a free 32 GB microSD card, extra battery and extra propellers, things that can be purchased as extras in Karma. It is also an RTF model, with everything ready calibrated to get going. 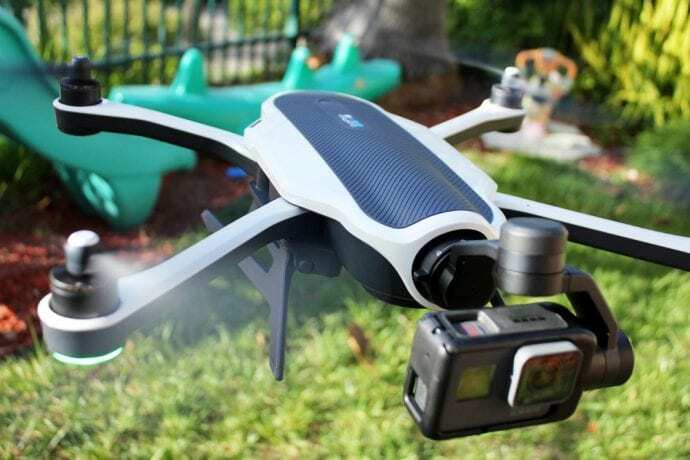 Like the Karma, Yuneec Q500+ Typhoon comes with a handheld CGO SteadyGrip for more stabilized images by detaching the drone camera and mounting it on this grip. 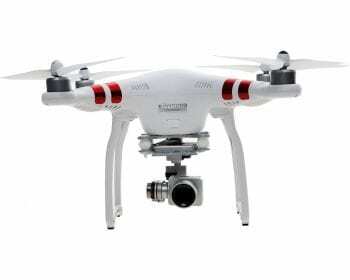 It also features a longer flight time of 25 minutes similar to the DJI Phantom 3 compared to the 20 minutes of Karma. The flight time is made possible by its powerful battery of 5200 mAh. The drone is almost priced the same with Karma at $800. The advantage of this drone, however, is the inclusion of the extra battery and extra propellers. With Karma you have to spend more to have replacement parts delivered to you. Here’s another quadcopter that is less priced at around $500 compared to the $800 of Karma. It comes with the bundle gimbal battery and 2pk propellers. 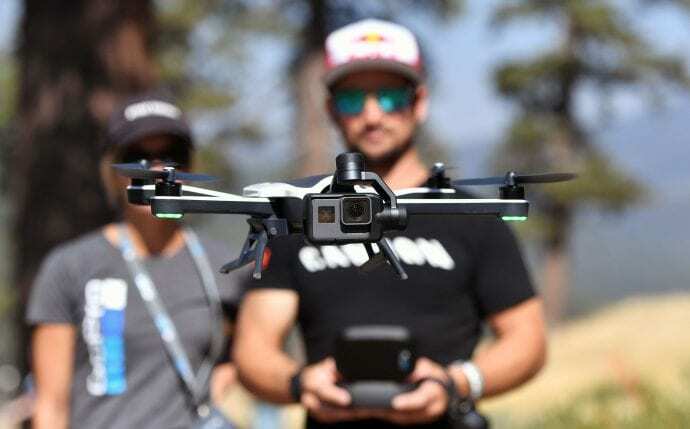 The drone is compatible with the GoPro’s HERO3, HERO3+ and HERO4 action cameras. It is beyond the doubts that Karma wins the battle here with its optimized HERO5 Black harness. Furthermore, the 3DR Solo drone allows you the opportunity to save the footage directly onto your phone. It has an app that can be downloaded on iOS or Android-powered smartphones. The drone and the camera can be controlled with the remote controller. Karma is a perfect choice for beginners as it is an RTF model that comes with a pre-flight trainer, interchangeably called the flight simulator. It orientates the pilot to understand the drone and its flight modes. So there’s no need to do an intensive research on how to fly it because of this feature. 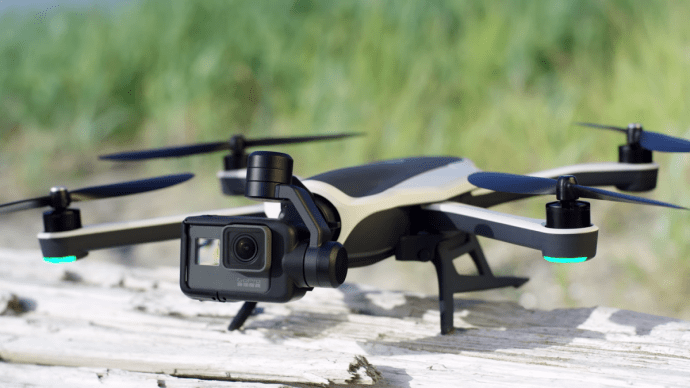 Because GoPro is a giant manufacturer of flagship cameras, it is presumed that Karma will be an excellent tool for videographers and photographers with its 4K video recording and 12MP images. 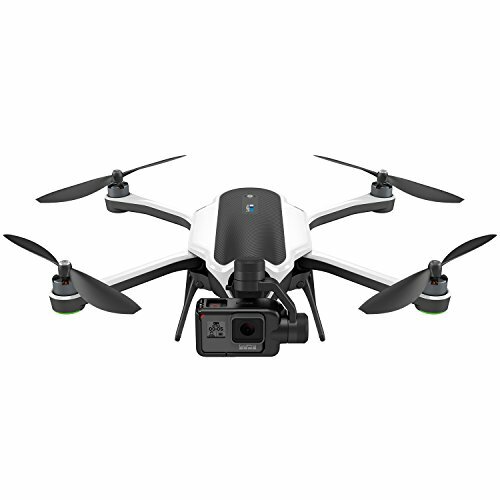 It can capture high quality aerial images with the optimized HERO5 Black camera mounted onto the body or handheld with the Karma Handle Grip. The availability of the replacement parts for Karma is certainly a huge sigh of relief to newbies. Flight crashes may be imminent and inevitable, and as such one needs replacement parts for in case. But GoPro Care can cover for such crashes in a period of 2 years after purchasing your multirotor. All these are available at affordable prices. Karma is undoubtedly a great camera-optimized quadcopter, even though it might not be pleasing to UAV gurus due to elementary controls. It is nonetheless designed to accommodate also the beginners as also noted in the flight simulator feature included. The beginner pilot can master the flight eventually by persistently following the guidelines. The flight modes are quite exciting as well. If you are up for a simple yet high-performing quadcopter, Karma is for you. It is one of a kind that enables your partner to also control the camera settings on their smartphones. It is also undoubtful that you will have an amazing experience with the HERO5 Black camera from the camera giant, GoPro. The flight controller enables a wide range of acrobatics for this drone. 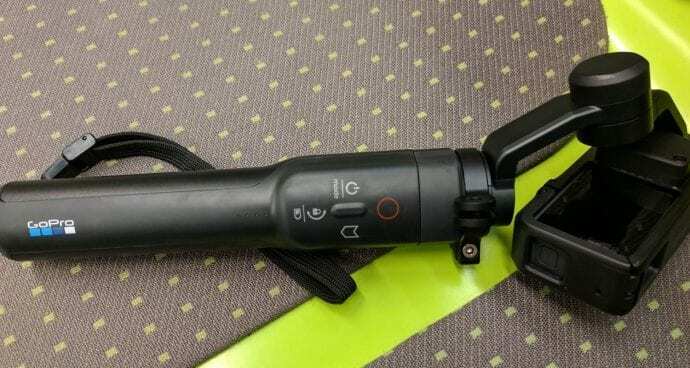 It has a simple user interface for an intuitive manipulation with just 2 joysticks, a start button, and a touch screen on which most controls are managed. The passenger app is an amazing add-on feature that makes this drone stand out of the crowd.